( buttons guide you to the pages written in Japanese. To my thanks, I have been receiving emails occasionally from various readers in Japan and from overseas. I am going to post some of those communications suitable for open discussions, in the present page. There are comunications in the Japanese page also, though not shown in this English page. Poverty problem is an important issue in many other countries as well. Jan. 11 Vladimir Petrov (Israel) Books authored recently. Mar. 7, 2016 Nakagawa ==> Tan Eng Hoo (Malaysia) "The Rising TRIZ Generation"
Dear Toru; It is very good to continue receiving your TRIZ reports, though I am not very active in the field any more. Thank you very much for continuing to send them, and to report on these important topics. I hope you are very well, and I want to wish you our "Happy Holidays" from here in Arizona, where it is Snowing! Dear Toru, Thank you so much for the recent update to the TRIZ Homepage in Japan, and for your kind season's wishes to all its readership. I also wish you and your family a Merry Christmas and a Happy New Year 2016. I again congratulate you on maintaining the very high standard of the THPJ and hope that with the added support of its contributors, we can expect a very good 2016 for this excellent resource. Your focus on the problems of some of the elderly existing on very meager resources in their twilight years, is a global issue. I have been away from the USA for some years now, but believe that the same problems which you are highlighting for Japan are also present there as well as in Australia and in other parts of the world. The sad truth is that more than enough national resources are always available for unchecked expenditures on military and grand prestige programs. The wastage there is mind boggling. Yet the national willingness to approach and resolve domestic issues of fundamental importance is simply not there. This is a vital issue which you have raised in the THPJ. I will try to offer some ideas and hope that TRIZ experts from around the World will contribute their thoughts in the New Year. Your fine photograph of the yellow leaves in a Berlin Park is a Christmas treat. In days gone by, one could ask about the name and style of the camera, its format, the ASA / type of film, the lens used, the f-stop settings, the filters used, etc. etc. These days digital cameras are doing some of the specialized work for us. It would great if available technology could also be utilized to address the multiple issues of the distressed and elderly as you have mentioned. It still requires the skill of the photographer (i.e. the politicians and leaders) to first visualize and frame the scene. Merry Christmas and happy new year to you and your beloved family. Dear Toru Nakagawa-san, Thank you very much for very valuable information. Dear Toru Nakagawa san, Wishing you & your family a Very Happy Healthy Prosperous New Year 2016. I also wish your team a great success. Continue to spread "Shiny Eyes & Smiles" with your knowledge and experience both within & beyond. New rapidly changing socio demographic economic challenges need relevant economic financial transformation models which at times may sound even challenging the proven existing models which survived the precious cyclical patterns without attachment by the creators or patronisers of the earlier models. as the Innovation Model with inspiration from the core sanskrit ancient verse ( Shrusthi-Sthithi-Layaa duties). See if you can apply your solution model in the above pattern to find new solutions when you overlap with your model for the problem of poverty among elderly involving key stakeholders. Just a thought personally sharing with you humbly for your kind consideration. Dear Professor Toru Nakagawa, Thank you for the infjrmation. Growth Hacking for Breakthrough and Inventors. 5-Step Method for Breakthrough (Kindle Edition). 2015. Ten tips for high scoring the International TRIZ Level 3 Professional certification. A sharing by a group of TRIZ practitioners who journeyed through the learning process, sat for the professional test and achieved 100% passing rate. I am so happy to meet the TRIZ Journal again after so long period of silence and inaccessibility. I dream about time when TRIZ will become not only an effective tool set, but also the understandable and necessary science for creative design thinking. Dear Toru, Hope you are fine, without any pain in the legs. Is there a tool, maybe in Excel, and in English, to Fuda-Yose? Or a reference where the method is explained?. I tried to translate from Japanese, but it was unsucessful. Dear Hugo, Thank you very much for your message and for your interest in our Visual Thinking method and its tool. On your request I reviewed our English pages in my Web site and revised various points in relation to the tool and its usage. I have just uploaded the revised pages and hope you can find necessary information in English. (2) Then you can be guided to various relevant and existent pages in English. (3) In short, Fuda-Yose Tool (English Edition) is downloadable without charge . It is an Excel file with macros. It has user interfaces in English. It has a full instruction in English. (4) There are several visualized examples in English, already posted. We, Akihiro Katahira, the developer, and me, are looking forward to hearing from you again on your experiences with the tool and the method. I appreciate your response in such a short time. It would be my pleasure to let you know my experience with the method. By sure, I will give it a try! Dear Hugo, Please access to the following link . This is a part of the page accessible from the Top page of my site. Please try to follow HTML pages. All the important information are shown in the HTML pages, and some details in the PDF files. All received and it is crystal clear for me now. The excel file is downloaded. I will let you know about my use and application of the tool. Thanks. My apologies, because I could not find the file from my own! Toru Nakagawa ==> Tan Eng Hoo (MyTRIZ, Malaysia) Mar. 7, 2016 "The Rising TRIZ Generation"
Thank you very much for your sending me a lot of information on your TRIZ activities in Malaysia. "The Rising TRIZ Generation" is especially impressive. I introduced your activity in my "Letters From Readers" page. Could you please allow me to re-post your "The Rising TRIZ Generation" in my Web site (in stead of a link)? Could you send me its PDF file? Glad that you enjoyed and are willing to help us sharing the learning. Enclosed is the PDF file. Please proceed to share and encourage others to learn the methodology. Your update to the THPJ arrived about 6 days ago. I had thought that I would be able to write something useful but have not been able to do justice to the considerable effort you have put into the preparation of the document. The issue of the "Low Living Elderly" is a very major one. If our societies and governments were managed by intelligent, clear thinking persons, this issue would surely be at the top of the list. You are doing a great service by highlighting and formulating the "Low Living Elderly" (LLE) in a better context for the attention of the public. I have quickly looked at the English descriptions of the 7 chapters of Takanori Fujita's "The Low-living Elderly" Book. These are very well thought out. Would you please consider a stand-alone version of book in English PDF as one of the central themes of the THPJ. This way the reader can go to the book directly, read it, and formulate their thinking. The Fuda-Yose treatment of the book should follow after the original as mentioned above. The impact of the message of Takanori Fujita's book may be improved by bold headlines for each chapter, the outlining of key statements within each chapter in colored borders, etc. This is best done in an English PDF version. Thank you very much for your message with valuable thoughts. 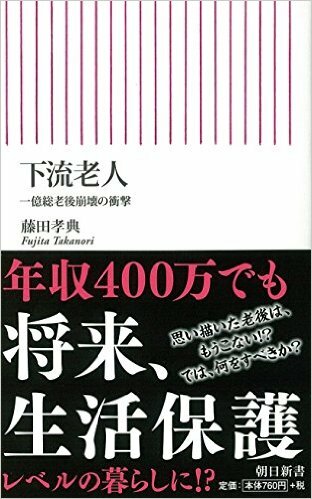 First introduce the messages of Takanori Fujta's Book itself in English for highlighting the issue itself (by revising my introductions written in chapter by chapter). Then the introduction to the visualization methods/diagrams/tools may follow in English." I will try to revise (or make new) my pages following your suggestions. Many thanks for your reply. You have understood my suggestion perfectly. Similarly, I would suggest that Takanori Fujta's Book should form a banner centerpiece of the THPJ till such time as this is a topic of discussion. This way the reader can instantly refer to the source of the discussion in its original form. As you have noted, the further analysis and representations in Fuda-Yose format as well as other representation forms can follow the original version. It may be considered that the English translation of the original short book includes numbered headings, sub-headings, perhaps even the paragraphs and certainly the chapter-wise conclusions and recommendations are numbered as well. This scheme could be cross-referenced in the diagrams and representations which follow so that the reader could directly refer back to the original source for context. "The Low-living Eldrely" Pamphlet: Cover page and Back cover page. "The Low-living Elderly" Book, Cover page. Dear Toru, I am using Fuda-Yose method as an exceptional tool to summarize books. Clear and simple. By sure, there are more fields to apply it: problem solving; resuming an strategy; briefings of meetings; organize books to be read ; etc. It works perfectly on Windows; but I can't use it in Excel for Mac. Thanks for all your help and patience! Hugo Sánchez， Nicaragua, Central America. Dear Hugo, Thank you very much for your message. We are very much delighted to learn that you are using the Fuda-Yose Tool so nicely, and find it useful for many chances of work. Luo Lingling (China) ==> Toru Nakagawa Apr. 4, 2016 "The Low-living Elderly"
Thanks for your letter, I have seen your picture in the homepage, it's very beautful. Now in my city , Spring is also coming, trees are green soon. I like cherry blossom very much, so I really admire you have that beautiful backyard. However, in Shenyang, cherry blossom comes a little later than Japan, maybe in the early May. I can search the book which you have introduced on the internet. The low-living elderly is also a serious problem in China, especially in rural areas, because of the imbalance of economic development. In recent days, I am really very busy, so I will read the content of this book after a period of time. Thanks for your recommendation. Many thanks for preparing the English translation of Takanori Fujita's book "The Low-living Elderly" and including it in the latest update to the THPJ. The photograph you took of the flowers is pure art. I have not been able to look at the translation in detail. Sometimes, not looking at a problem statement in detail at the start is not necessarily a bad thing. There is a vague notion in the mind that a problem exists. The question then is how to X-Ray this vague description to get an idea of the skeleton of the problem. One can always go back into a better study of the problem statement in iterative cycles to improve the skeleton, as it were. Surely this complex problem has many underlying issues, which have been very well articulated by Mr. Fujita. Can we structure the problem in terms of the basic directions the author has already explained. The readership of the THPJ can be asked to at least do some brainstorming and send their ideas across so that the process can move forward. One of the ideas for Sydney's homeless which I read in a newspaper was excellent: Take some 10-30 story building in the City Center (CBD) which is presently lying vacant and unused and convert it into small residential units for use of the elderly or dispossessed. My own development of this idea would be to dedicate 2 or 3 floors for community purposes. One would be a pharmacy / health clinic with 24/7 attendance and greatly subsidized or free health care. The second floor would be a community space for various activities, games, visitors, etc. The third to be a kitchen/cafeteria/mini super market with subsidized food, and snacks. A laundry may be required as well. With government support, there could be 24 hour security/monitoring/assistance available. There would be no reason for the elderly to have to drive or be driven to various places. Groups could be taken around for day excursions in buses. etc. etc.